If we look back to as little as 30 years ago, taking a cruise was still a big deal. The number of ships was limited, itineraries were predictable and onboard facilities traditional. With the demise of the great liners, some of which were converted to cruising in their sunset years, the industry recognized that purpose designed cruise ships would be the only way to go if there was to be a serious effort to tap into the global leisure industry. With the number of ocean cruise ships now approaching 400, and with an additional 91, having a value of approximately $58 billion, scheduled for delivery by 2026, it seems that nothing can hold the industry back. Now hosting some 25 million guests per annum, having a global economic impact of some US$117 billion and a growth of around 60% in the past 10 years alone, the industry is in confident mood. The industry is also well organized in terms of political advocacy as coordinated by Cruise Lines International Association (CLIA) based in Washington DC. As the world’s largest cruise industry trade association, CLIA has the task of providing a unified voice, not only on behalf of the cruise lines, but also the approximately 25,000 travel agency members that help to fill the ships. Individually however, the cruise lines are competing head to head for every guest and every dollar. This has resulted in levels of design, innovation, hospitality and marketing, the likes of which leaves most industries trailing in their wake. While sharing a ship with 5,400 other guests is not for everyone, Royal Caribbean International has made it an art form with their three Caribbean dedicated Oasis Class vessels, soon to be joined by a sister, the $1.4 million price tag, Symphony of the Seas. While the number of Caribbean ports capable of handling these vessels is limited, sceptics have been silenced as the company has applied itself to converting concept to reality since Oasis of the Seas made her maiden voyage in December 2009. The slightly smaller Quantum Class vessels, with 4,200 guests, are equally successful but are trading internationally. As an example, Ovation of the Seas is scheduled to join the growing fleet of large cruise ships serving the Alaska trade in 2019 after spending the southern summer in Australia and New Zealand, another rapidly growing cruise market where several cruise ships are now positioned year-round. Another notable trend is the rapidly growing sector of expedition cruises. These are expensive, but this is no deterrent for those with money and an appetite for adventure. 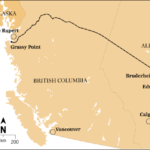 As an example, the summer voyages of Crystal Serenity through the Northwest Passage have not gone unnoticed by an industry seeking to offer a unique experience at the ends of the earth. With this objective in mind, 22 of the cruise ships currently on order are ice-strengthened. From a technical perspective, the cruise industry has always been at the cutting edge of development. In terms of innovation and design, current trends are externally evident in the impressive new 5,200 guest capacity MSC Seaside, currently enjoying her maiden season in the Caribbean. No effort is spared in combining onboard luxury with a labyrinth of waterslides and a limitless range of other leisure facilities in an attempt to suit the taste of every demographic. On modern vessels, For economy cruisers with inside cabins, there are “virtual balconies” – essentially floor-to-ceiling LCD TV screens, are linked to a camera mounted externally to ensure that you miss none of the scenery. To the surprise of many, naval architects have also been given license to resurrect the vertical bow design with Carnival Group subsidiary Aida Cruises, which primarily serves the German market, being the first to go down this road. The new design helps to improve fuel efficiency but to the purists the early 20th century battleship bow is less than aesthetically pleasing. 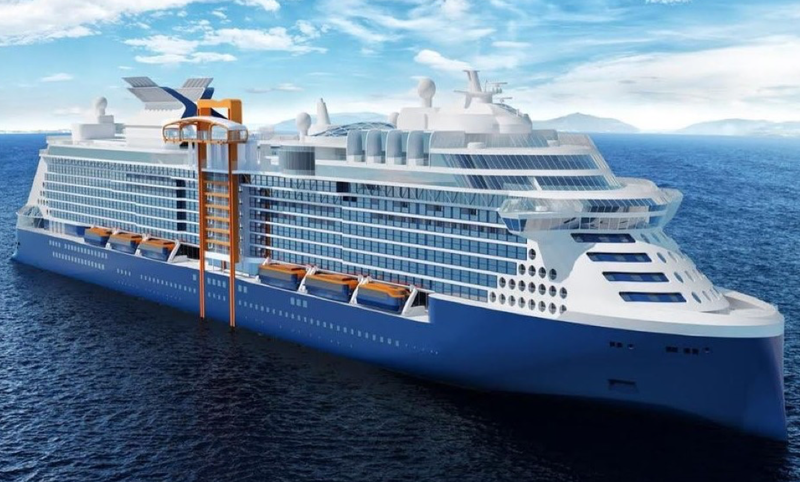 The first to adopt the vertical bow in the Royal Caribbean Cruises Group is the new Celebrity Edge class of vessels, the first of which is to debut later this year. 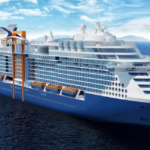 Celebrity Edge also dispenses with traditional balconies which are replaced by staterooms which extend to the side of the vessel and incorporate large sliding windows. Another unique feature is the incorporation of a 90 MT cantilevered platform known as the “Magic Carpet” that doubles up as an dining area at sea and, when tendering, as a docking platform. This then leads to the question as to where all these new (and existing) cruise ships will trade. Significantly growing markets already being tapped lie in Asia, in particular China, but also Japan, Korea, Taiwan, Vietnam, Thailand, India and Sri Lanka. Taking China alone, one study for potential guest numbers is around 80 million, perhaps a bit of a stretch but given the rapidly accumulating wealth of the Chinese middle class, every major cruise line is aiming to take a share of the action. Since the initial foray of Costa Cruises (on behalf of the Carnival Group) into China in 2006, and despite the recent Chinese economic boycott against South Korea, cruising from China has boomed and appears to have infinite potential for growth. 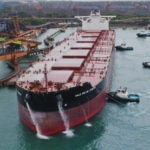 By 2015, Costa Asia was ready to launch China’s first 46-day cruise to the South Pacific Islands on Costa Atlantica from my old stomping ground, the Port of Tianjin. 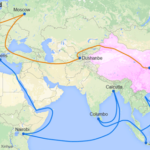 Consistent with China’s “Belt and Road” initiative, the cruise was promoted as an important milestone in cooperation between countries along the “road” in travel, business, culture, education and transportation. Today the major cruise lines are far advanced in building joint ventures with Chinese mainland entities, one example being the Carnival Group which has partnered with the mainland based “China Merchants Group” to grow the cruise industry but also with China State Shipbuilding Corporation (CSSC) and the Italian specialist cruise ship builder Fincantieri. The objective is to lay the groundwork for the future ordering of new builds in China, a prospect not universally welcomed by many traditional cruise ship builders as it raises the prospect of transfer of technology and expertise which will then be used to compete. Staying with the theme of destinations, the United Arab Emirates ports of Dubai and Ab Dhabi have also established themselves as both turn-round and destination ports. In 2006 Costa Cruises and AIDA Cruises began cruising within the Arabian Gulf, to India and beyond, with unexpected success. It should perhaps be mentioned that these destinations are not being served by older cruise ships that no longer meet the expectations of the American and European markets. On the contrary, these new markets are being developed using some of the most modern tonnage available as guests pour over their computer screens to find historically and culturally interesting new destinations to visit, all from the security of being based on a cruise ship with a multitude of tours to choose from at each destination. Indeed, the cruise lines have developed the marketing of lucrative shore excursions that cater to the depth of all pockets into an art-form. Going back to the ships themselves, there appears to be no end to the imagination of naval architects and interior design professionals as they are let loose to build and fit-out vessels that will set them apart from the competition. No matter where you look, P&O, Princess, Disney, Genting/NCL, MSC, Royal Caribbean and Celebrity are but a few examples of some of the most amazing interior innovations to hit the world’s oceans and thereby make the ship itself a memorable part of the cruise experience. Add to this, world class onboard entertainment, celebrity chefs, speciality restaurants, lectures in every subject you can imagine and onboard staff whose only purpose in life sometimes seems to be to keep you content. Impeccably maintained staterooms, lounges and open deck areas is today’s norm and then of course there is the gym and the spa. The gym is free as an antidote to the damaged inflicted by the 24-hour buffet but the spa will liberate you of a few dollars when the ladies choose to pamper themselves with a little treat. Of course, the cashless onboard society makes spending really easy as everything goes on the identification card /security pass issued at embarkation – only to await the final day of reckoning. Obviously, an industry growing at a consistent 5-6 per cent a year attracts attention. The costs of entry are considerable but that has not deterred investment by private equity firms attracted not by the romance of the cruise industry but by a relatively safe annual average rate of return on investment of between 6 and 8 percent. The trend seems to be for such firms to leverage a window of up to 10 years to grow a privately owned cruise line before selling it or taking it public in order to return profits to investors. In this context, despite the considerable marketing skills of Richard Branson and his team, Bain Capital will be the majority shareholders in Virgin Voyages when it launches in 2020. Of interest, the vessels will be mid-sized at 110,000 GRT with capacity for 2,700 guests and will be the first in the industry to limit guests to a minimum of 18 years of age. The target market is said to be first time cruisers as the industry seeks to reduce reliance on the baby-boomer generation. So, what are the challenges? Larger ships represent lower unit costs but also demand major port investments to service them. 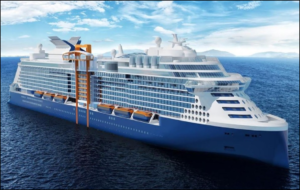 The use of tenders as a means of accessing smaller ports on a tight schedule is not always popular with guests, hence the innovative solution on the new Celebrity Edge. However, in common with the container industry, ports worldwide are struggling to justify the investment required to meet the aspirations of the cruise industry. This translates to many multi-purpose terminals being spring cleaned and security zoned to act as stop-gap cruise facilities with the “condition of the terminal” then being a main talking point among guests over dinner. 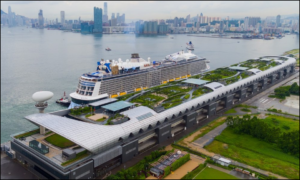 The dilemma is well illustrated by the impressive new one billion U.S. dollar Hong Kong cruise terminal constructed on the site of the old Kai Tak Airport which was built only after much hand wringing by the Hong Kong government. The operating model is typical of the emerging trend whereby the operator is required to pay the government an agreed rent for a fixed term plus a growing percentage of the operator’s gross receipts as variable rent. Thus far, the under-utilized terminal is struggling, a fact which has not gone unnoticed by regional competitors faced with similar infrastructure investment decisions. A primary factor in Hong Kong is the distance from the city compared to the popular, but size restricted, downtown cruise terminal in Kowloon. Another major challenge is that of fuel costs. The cruise industry is a master of micro-management in fuel consumption and port versus sea time, the more so since the advent of Emission Control Areas. 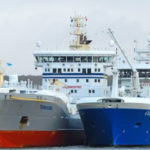 Looking ahead to the 2020 fuel standards, the Carnival Group has made a major investment in Exhaust Gas Cleaning Systems (scrubbers) but recent newbuilds are focused on LNG. Carnival is currently committed to build nine LNG-powered cruise ships across four of its nine global cruise brands with delivery dates between 2018 and 2023. In addition to its own brand, the three others are AIDA, Costa and P&O Cruises. For its part, MSC Cruises has four “World Class” 200,000 GRT LNG fuelled ships on order with STX France, Royal Caribbean has two “Icon Class” 200,000 GRT LNG fuelled ships on order with the Meyer Werft yard in Papenburg, Germany, along with Disney which has three 135,000 GRT LNG fuelled ships on order at the same yard. This trend is certain to accelerate across the sector. Whatever, the challenges, it seems that only a major geo-political event can throw the cruise industry off-course. There were dips after 9/11 and again when the global recession took hold in 2008/09 but this is an industry that knows how to bounce back and is set to continue its trajectory of growth. If you haven’t tried it, I would recommend you doing so. It’s good value and a relaxing way to vacation in whatever part of the world you choose.